A couple of weeks ago, we reviewed the enormous and powerful ZappBug Room bed bug heater. The Room is the largest heater of its kind, and is the perfect choice for professionals looking to speed up treatment times, or private users looking to quickly treat mattresses or a ton of personal items. But what about homeowners who want to heat-treat on a budget, or don’t want to spend the time unfolding and assembling the beastly Room? ZappBug has an answer for that, and the answer is the ZappBug Heater. While you could fit 20 Heaters in a Room (although I don’t know why you’d want to), the Heater is by no means undersized. It’s larger than some of the most popular bed bug heaters on the market, like the PackTite and the Thermalstrike Expedition. It’s also very affordably priced, making it arguably the best value in bed bug heaters today. The Heater ships in a single, deceptively small box. 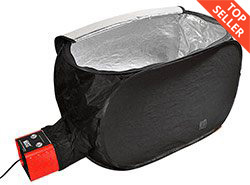 Tightly packed inside are a folded tent with a carrying bag and support net, two foam support blocks, a plugin timer, a wireless thermometer, a heater unit, and an instruction manual. The tent unfolds in seconds in your hands, and requires no additional assembly. Due to the much smaller dimensions (and some clever engineering), there is no separate frame to fit inside. The only other step to assembly is to fit the heater unit in the elastic ventilation tube. Unzipping the Heater from the top reveals its spacious, insulated interior. If you plan to treat heavy, rigid items (like luggage or small furniture), place the foam support blocks on the bottom before putting those items in. For loose items like books and clothing, use the support blocks followed by the support net, which hooks into place at six points. The whole assembly, from unbox to ready, took me about three minutes. It doesn’t get much easier than this. Once the Heater is assembled, it’s time to fill it with what you want to treat. The Heater can accommodate most luggage or a small piece of furniture, like a chair or end table. With over 13 cubic feet of internal space, the Heater could also fit your shoes, books, and other personal items comfortably. Just try to avoid stacking loose items too tightly, and leave a couple of inches between individual items for airflow’s sake. We threw some folded clothes, shoes, towels, and Josh’s man-purse (though he insisted it’s called a messenger bag) in the Heater, and still had room to spare. By sticking the included wireless thermometer probe in an open pocket in the bag, we were able to monitor the temperature of the items themselves, as opposed to the open air temperature. This is key, because the air will hit 120 degrees a lot faster than the items themselves will. After closing up the Heater, it’s time to plug it in and start cooking. The included timer is a must for safety and convenience; after the cook time reaches the set duration, the Heater will automatically be shut off. Since we don’t know exactly what you’re putting in the Heater, we advise setting the timer to its maximum setting, to ensure that everything inside has time to reach the right temperature. Since this compact ZappBug has only one heater unit, compared to the Room’s four, we found the noise to be much less noticeable. There was also no ventilation fan or extension cords to fuss with. In our test, everything hit 120 degrees after about three hours – in the case of a bed bug infestation, we would run it an additional hour just to be safe. Our enthusiasm for the ZappBug product line hasn’t diminished a bit after playing with the portable ZappBug Heater. This is our new recommendation for homeowners that don’t have the closet space (or the budget) for something like the Room. It also boasts the fastest setup and breakdown time we’ve seen with a portable heater. You get a bit more bang for your buck by opting for the larger Oven, but there is nothing in the Heater’s price point that comes close to competing. Kill 100% of bed bugs in shoes, books, files, papers, clothes, bedding and much more. Designed to fit carry-on or checked luggage. The ZappBug Heater is portable and can be assembled by one person in under 10 mintues.